Pitties are known for their smile. Pit bull terriers are often feared, but pibbles, as their aficionados often affectionately call them, are muscular, goofy, intelligent dogs who've been saddled with an unsavory dog-fighting past. By properly training your pit bull, you can help put a damper on the pervasive negativity surrounding these big-hearted dogs. Teach your puppy manners as soon as she joins your family. Don't allow her to jump on people, mouth, steal food or run away with objects that don't belong to her. While it's important for all dogs to be polite around people, it's doubly so for pit bulls. Because they're judged for their every action, no matter how insignificant, your pup's behavior needs to be above reproach. Set and enforce family rules, guidelines and expectations from the start. Enroll your little pal in a puppy socialization and training class. By exposing her to a variety of people, places and experiences, you can help her develop a well-rounded and stable temperament. Teach your pibble basic obedience commands, including sit, down, stay, come and heel. Consider obtaining the American Kennel Club's Canine Good Citizen certification or the Association of Pet Dog Trainer's Canine Life and Social Skills BA certification. Both certifications attest to your pooch's good manners and obedience while in public. Train with your pit bull every day. While you don't have to take more than two or three minutes per day, those minutes add up quickly like drops of rain in a bucket. Work in a little bit of obedience, manners or trick training whenever you find yourself with a couple of spare minutes sorting mail, waiting for the water to boil or during commercials. Add trick training to your list of important things to do with your pibble. Pit bulls are inherently intimidating dogs, and the negative hype surrounding them adds to that persona. Teach your pup cute tricks like sitting pretty, shaking paws or rolling over to help break the ice when they're meeting new people and to help present them as goofy love-bugs instead of simply over-muscled monsters. 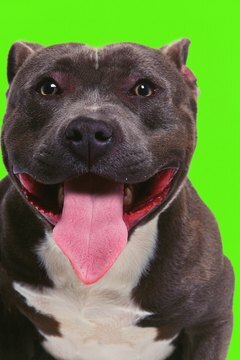 Pitbull Lovers: PitBull Training Questions, or How do I Train My American Pit Bull Terrier? Dog Trick Academy: How to Train a Pitbull Terrier & Understand Your Dog! Since 2001, Kea Grace has published in "Dog Fancy," "Clean Run," "Front and Finish" and an international Czechoslovakian agility enthusiast magazine. Grace is the head trainer for Gimme Grace Dog Training and holds her CPDT-KA and CTDI certifications. She is a member of the APDT and is a recognized CLASS instructor. She's seeking German certification from the Goethe Institut. What Does an American Pit Bull Terrier Look Like?